Join us for a walking tour of the few landmarks remaining from the Centennial International Exhibition of 1876, the first official world’s fair in the United States, attracting nearly 10 million visitors to Philadelphia’s Fairmount Park. Our tour begins with the Exposition model, a restored miniature diorama of Fairmount Park during the 1876 Exhibition, located in Memorial Hall, now home to the Please Touch Museum (admission is included in the tour ticket). Architect Philip Scott of KSK will take us through Memorial Hall, which over the years has served as the first Philadelphia Museum of Art, a recreation center, a police station, and a recording studio before falling into disuse. We’ll learn how a six-year, $88 million restoration and reuse project (a 2009 Grand Jury Award winner) brought this distinctive structure back to life. Conservator John Carr and members of Materials Conservation Co. will then explain their efforts to restore two signature works of art from the Centennial. 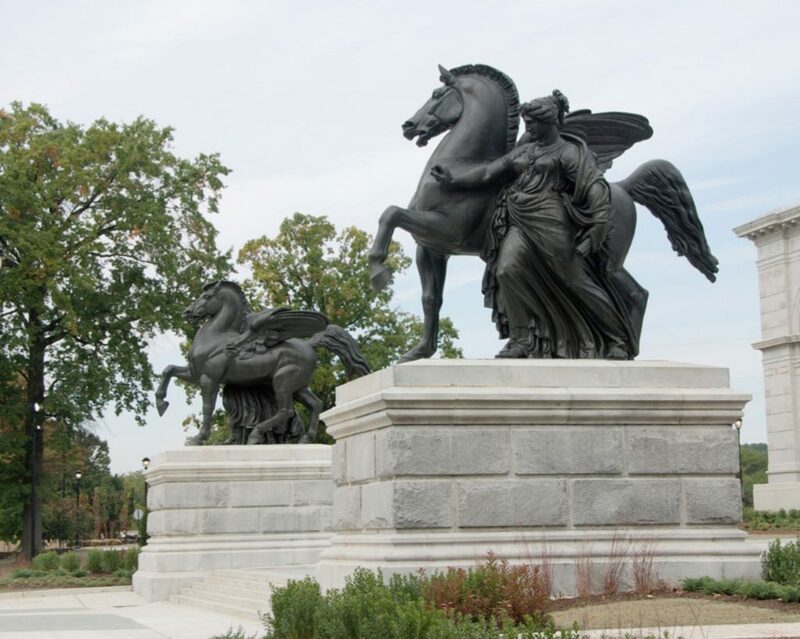 We’ll first visit the Pegasus statuary, renderings of the mythical flying horse that stand as guardians to Memorial Hall, to hear why the restoration (a 2018 Grand Jury Award winner) is considered one of the most complicated sculpture conservation projects ever undertaken in Philadelphia. Last, we’ll walk to the Catholic Total Abstinence Fountain (near Mann Music Center), which commemorates the Irish-American influence on the 19th century temperance movement with sculptures of religious and patriotic heroes, from Moses to Commodore John Barry. We’ll learn how a seemingly forgotten monument that had become a public hazard was restored to its former vitality. Tour meets at 6:00 PM at the Pegasus statuary outside the main entrance to the Please Touch Museum (4321 Avenue of the Republic, Philadelphia, PA 19131). Questions? Please email tours@preservationalliance.com or call 215-546-1146 ext. 4.